Glorify the tables of your religious event with a stunning cross set as a center-piece on each. Are you planning a baptism, a communion, a christening or another religious event? 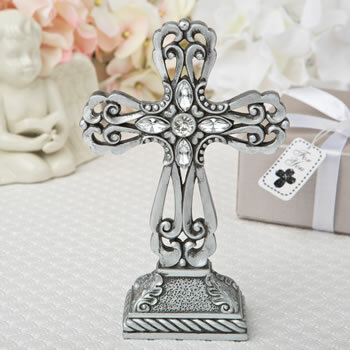 Your tables will look magnificent with this beautiful cross as a center-piece. The cross is crafted from poly resin, painted in a pewter colour with antique accents to finish the look. It stands on a solid base that is decorated with a rope design and a pebble finish. The cross features an ornate cut-out filigree design and sparkles with five clear rhinestones. A perfect table center-piece that can also be used as a matching cake topper. Size is 6 1/4" x 4"